We’d love your help. 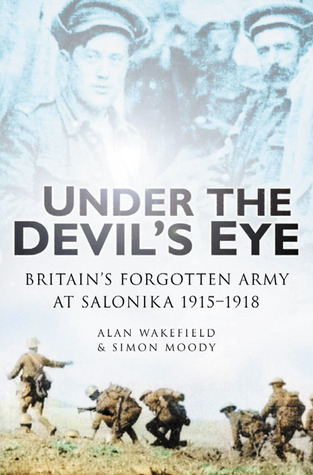 Let us know what’s wrong with this preview of Under the Devil's Eye by Alan Wakefield. To ask other readers questions about Under the Devil's Eye, please sign up. Extremely well researched this book provides great depth, details combined with well selected personal accounts. Even if one has no prior understanding of the front it's easy to understand. I read this book as the Squadron in which I currently serve was one of the Field Ambulances that took part in this campaign. In addition, although I am a keen amateur military historian, I know almost nothing about this particular aspect of the First World War. The book is well written and easy to read. Although it is very date-factual, as almost all history books are, there is liberal use of first-hand accounts of the various aspects of the campaign, especially the two main Doiran battles. The au I read this book as the Squadron in which I currently serve was one of the Field Ambulances that took part in this campaign. In addition, although I am a keen amateur military historian, I know almost nothing about this particular aspect of the First World War. The authors also divided the book to look at the separate aspects of life and campaigning in what seems to have been an extremely hostile environment, with extremes of both terrain and weather. I found it fascinating to read the accounts about life in the front line, in the rear and particularly the role of the medical services. I don't remember my grandfather. He died when I was about 3. I've searched my memory, but there is nothing there. However, my mother told me that he'd served in Salonika during WW1. He also left behind a brass matchbox case that he'd made. It was engraved with dates and his service record from his war. I decided to try to find out moe. I was so glad that I came across this book. It certainly helped me to fill in some gaps in my family history. I loved the sections that gave personal stories from I don't remember my grandfather. He died when I was about 3. I've searched my memory, but there is nothing there. However, my mother told me that he'd served in Salonika during WW1. He also left behind a brass matchbox case that he'd made. It was engraved with dates and his service record from his war. I decided to try to find out moe. I was so glad that I came across this book. It certainly helped me to fill in some gaps in my family history. I loved the sections that gave personal stories from the soldiers.